I managed to get (2) of my ufo tops quilted— now need to do the bindings and load up another one. Getting them quilted is definitely a boost to my motivation. I will try to get some pictures this weekend- I don’t think we have a bunch of plans. I did have a UFO-a lot of blocks my daughter gave me after she lost her joy in quilting. Modified log cabin blocks, many with sashing already sewn on. The trouble was, her machine was giving her lots of tension issues & ALL the seams were very poor. I took out every seam which wasn't a chore since one side of them was so loose. I redid all the seams & put on sashing. All such pieces were cut so I only had to sew things together. 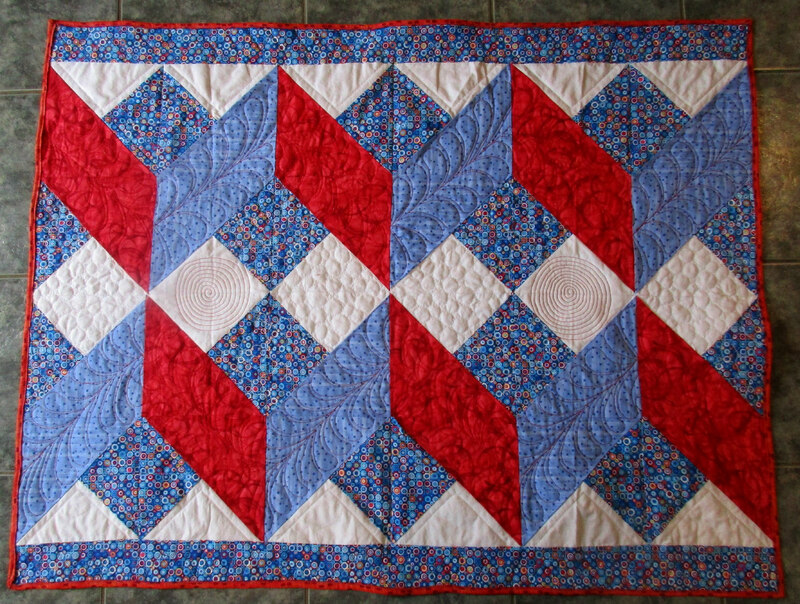 I've put it all together, quilted it, & finished the binding on Tuesday. A friend in the hospital will get it on Friday when I go see her. So-a completed UFO for April! I have a new phone which isn't showing the option to upload a photo, so I'll have to do that from my computer I guess. This is is the longest (1 week) I have gone that I have not started a big project. It feels weird. Lol...I have just been playing with small projects. Made a bunch of pincushions from scraps to use up a bag of crushed walnuts, cut scraps into the sizes I inventory, made some more 2" 9p, last night I EPP 65 hexi's. First time I EPP...didn't realize it would go so fast. Lol.. I ran out of paper hexi's so running to store to buy more. Have no idea what I'll do with them yet just thought I'd make some and be inspired....and to quit feeling lazy..lol..
Good job on that UFO of your daughter's Conchalea! Sounds like a lot of work but I'm sure your friend in the hospital will be blessed by your effort. Thank you SBG. I sure wish I still had my iPhone. Frustrating issues with the "find my phone app" made it necessary to get a Samsung Galaxy. I dislike this platform & now the QB doesnt give an option to upload photos from this phone. Sure glad I stumbled upon this response. I have a Samsung Galaxy tablet that I use a lot in addition to the dinosaur desk top computer. I have found I can't upload photos nor post a reply using the Samsung tablet. I have to forward pics to my email account, fire up the desk top computer and post from there - so annoying to say the least. Technology can sure be frustrating! Teen - that is a lot of work but so awesome, you placed all the squares perfectly! This one has been sitting around for a couple of years. I think it was a New Years' Day mystery quilt. Can't quite remember. Anyhow, quilted it with a bunch of stuff, feathers, pebbles, spirals and easy ruler work just to get it done. May put another line of ruler work in the white triangles. Watson that is great, are you using your DSM? I have never tried ruler work is it hard? Nothing new quilted for me, with the weird weather I just want to sit and read. Our local yarn shop closed today and sent a news letter saying happy January 145th. 9+ inches of snow in April makes me want to watch a movie and have a glass of wine. I'm off work tomorrow so maybe I'll clean the sewing room and find something to work on. I know I have projects to finish. Dedemac: The weather was definitely weird today! April in MN is all I can say. LOL! Conchalea: Congratulations on finishing your daughter's UFO! Bless your heart for taking the time to unstitch and resew. I sometimes have trouble with my iPhone not allowing me to reply. I have found that sometimes I logged out accidently or I am not in the web version which I have found on the bottom of the thread pages. I hope you get things figured out so we can see pictures. Dedemac, I am using a midarm, but you can easily do ruler work with a domestic. I did for along time before I got my Tiara. You just have to be sure to get the right size of rulers for your machine. Any dealer should be able to tell you which size you need. I would suggest the Westalee Starter Kit for a place to start. It has the foot and my favourite ruler in it, which is a straight edge on one side and an arc on the other. Connie, thanks for the tip on using web version. I scrolled down & sure e ought, it said 'full site' so I wasn't on the web version! I'm not sure why it changed on me, but I try the photo again. Nope. Photo is too large & I dont seem able to resize on the phone. I'll have to do it from my computer. Conchalea: I’m glad you found the full site version. I downloaded a free app for resizing photos on my iPhone. Last edited by retiredteacher09; 04-12-2019 at 04:31 PM. 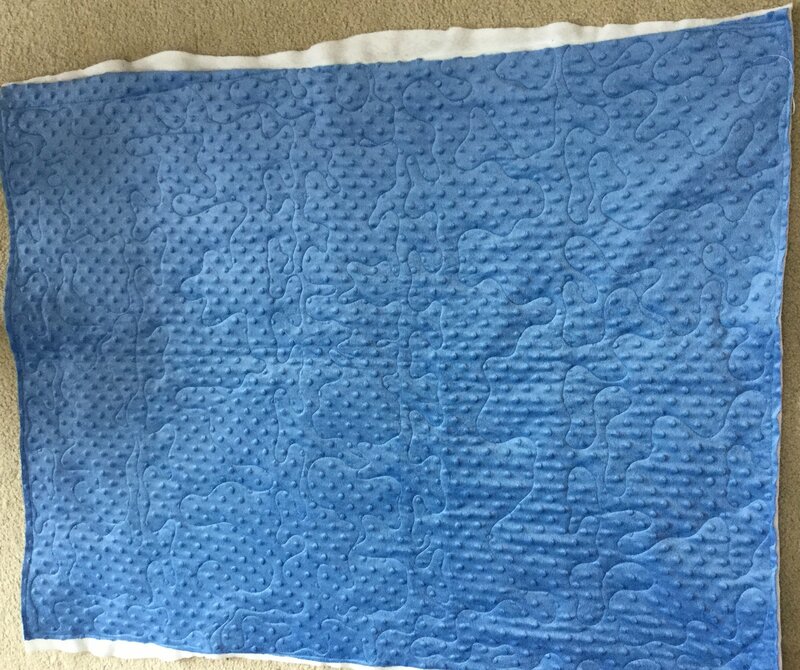 I gave the quilt to my friend today. She got teary-eyed over it. She's been in the hospital for 10 days, had to have emergency surgery, plus a follow-up surgery. It's been a long haul for her & her family, so I was glad to brighten her day a little. Conchalea, wonderful that your friend loved the quilt! I hope she continues to improve. For the past several days, when I access the site from my phone, I am also having to click on “full site” and then sign in! Even with the “remember me” box checked, I am having to sign in every single time. Apparently it’s a problem the site is having. Maybe we should report it. It’s annoying. Have several UFO's that need quilting. The quilt studio should be back in order next wk, so I can return to that project. Here are two ufos that are quilted, still need binding but getting there. Loaded up my Good Fortune quilt to quilt next. 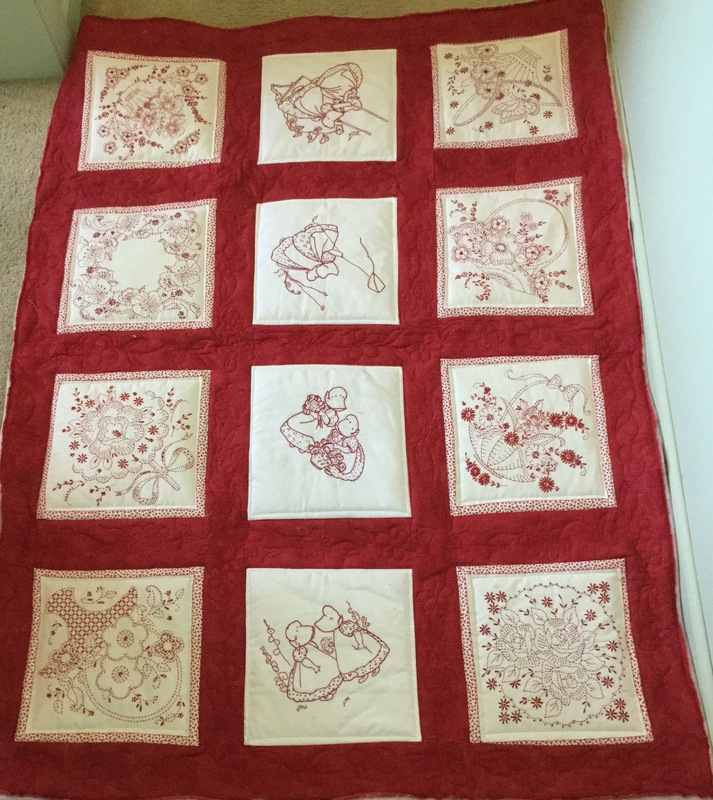 I think I still have 4 tops after the Good Fortune to get quilted- then I will start working on the ones that still need work to finish the tops. 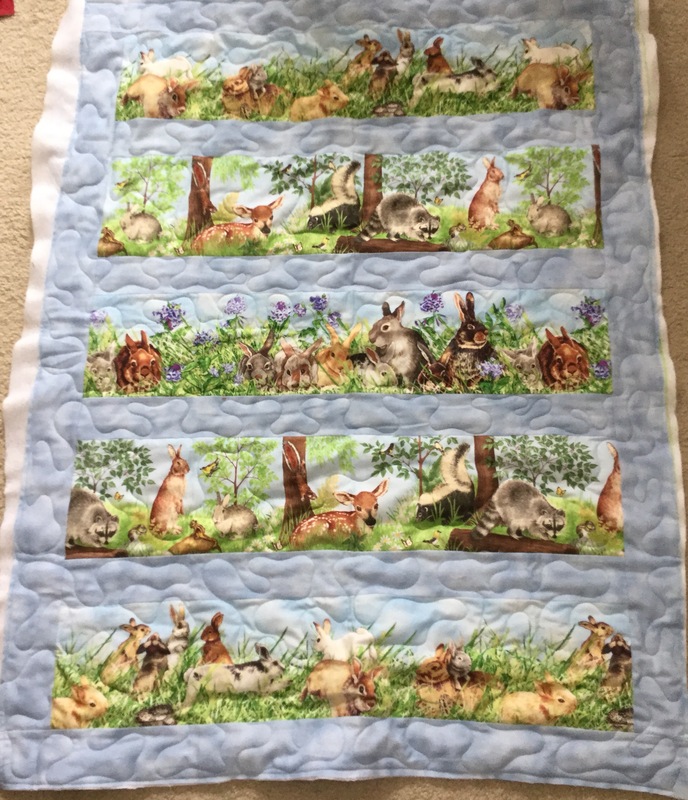 ckcowl...such pretty quilts...the rabbit fabric is so adorable. nice job! Love that redwork, ck! The bunny quilt looks sweet and comfy too, with minky on the back. I have yet to try using minky. Nice finishes. Lovely quilts, ckcowl. That embroidery has such beautiful detail. I've been working on the binding of my current UFO, and have started quilting the next in line. Thanks, they did! We were in Memphis with the kids for the weekend, visiting grandbabies. It was terribly stormy there, but we saw that the brunt of it was back home in Mississippi, south of us. I expected to see trees on the ground, all over the place when we got back, but things look pretty good here for all that weather. Ckcowl: Very pretty. Congratulations on your progress with the UFOs. Congratulations on finishing Ckcowl! Minky still intimidates me, but your quilt looks so cozy and soft that I may yet give it a go.